The growing diversity of the animals of Reserva Don Luis is a fresh source of delight every time we return. We don't play favourites, but it's impossible not to engage more with some of our more conspicuous guests. 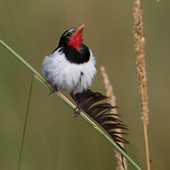 One of these is the strange-tailed tyrant. The male is stoic in his tolerance of one of nature's strangest - and it would seem least practical - adaptations. He's willing to suffer to be beautiful, and somehow manages to fly with tail feathers that were surely designed for a bird three times his size. We love his perseverance; his resolution to succeed against challenge, and his ability to prove that anything is possible. He's appearing in growing numbers on the Reserva Do Luis, and his success has become an allegory for, and a symbol of, our own. When we started the process of updating and redesigning our website, we wanted to adopt an image that symbolised our aims and our challenges. This brave little flycatcher, with his indomitable character, was the perfect choice. The logo is a stylised profile of a male tyrant, silhouetted against the sunrise. We coloured the sun the blue of the Argentinian flag in honour of this country's beauty, its climate and the breathtaking span of magnificent animals that it nurtures.